Perfect Balance is a sugar and filler free electrolyte balanced to match the proportion of electrolytes lost through sweat. Each serving provides concentrated chloride levels, and chelated minerals for improved absorption. It is perfect for re-hydration before and after strenuous exercise. 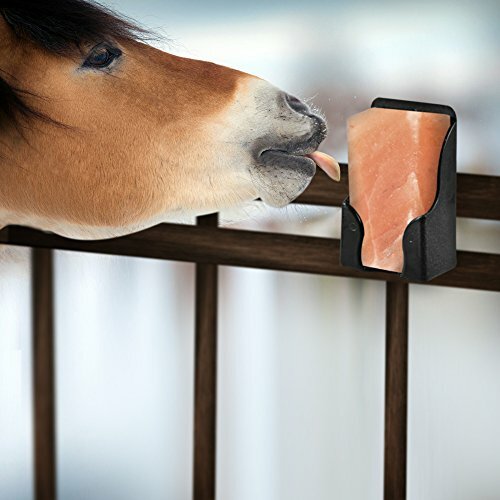 Made with high quality, food grade ingredients and featured as 2007 Horse Journal Product of the Year. Sugar, filler, Dextrose & Sodium Bicarbonate free. 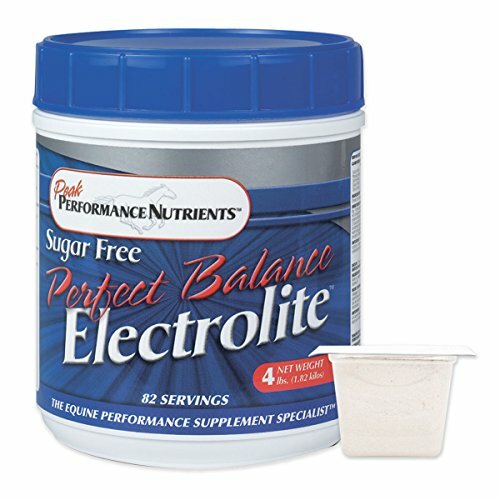 Perfect Balance Electrolyte is an excellent choice for performance, trail or IR horses. One dose is 2 level scoops (approximately 22 grams). In hot weather or with moderate to heavy work, feed one serving (2 scoops) per horse twice per day. When competing feed one serving (2 scoops) within 1 to 2 hours prior to competition. Immediately following competition, feed one additional serving (2 scoops). In cool weather/heavy work, feed one serving (2 scoops) per horse immediately following competition or training session. Make sure fresh, untreated drinking water is always provided to ensure proper hydration and allow the horse to consume water as needed. The 8 lb size will provide one horse with up to a 165 day supply. Not for human consumption. Perfect Balance is a sugar and filler free electrolyte balanced to match the proportion of electrolytes lost through sweat. Each serving provides concentrated chloride levels, and chelated minerals for improved absorption. It is perfect for re-hydration before and after strenuous exercise. Made with high quality, food grade ingredients and featured as 2007 Horse Journal Product of the Year. Sugar, filler, Dextrose & Sodium Bicarbonate free. Perfect Balance Electrolyte is an excellent choice for performance, trail or IR horses. One dose is 2 level scoops (approximately 22 grams). In hot weather or with moderate to heavy work, feed one serving (2 scoops) per horse twice per day. When competing feed one serving (2 scoops) within 1 to 2 hours prior to competition. Immediately following competition, feed one additional serving (2 scoops). In cool weather/heavy work, feed one serving (2 scoops) per horse immediately following competition or training session. Make sure fresh, untreated drinking water is always provided to ensure proper hydration and allow the horse to consume water as needed. The 4 lb size will provide one horse with up to a 82 day supply. Not for human consumption. Perfect Balance is a sugar and filler free electrolyte balanced to match the proportion of electrolytes lost through sweat. Each serving provides concentrated chloride levels, and chelated minerals for improved absorption. It is perfect for re-hydration before and after strenuous exercise. Made with high quality, food grade ingredients and featured as 2007 Horse Journal Product of the Year. Sugar, filler, Dextrose & Sodium Bicarbonate free. 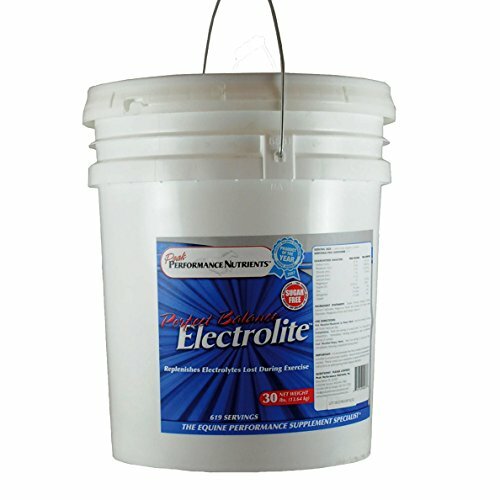 Perfect Balance Electrolyte is an excellent choice for performance, trail or IR horses. One dose is 2 level scoops (approximately 22 grams). In hot weather or with moderate to heavy work, feed one serving (2 scoops) per horse twice per day. When competing feed one serving (2 scoops) within 1 to 2 hours prior to competition. Immediately following competition, feed one additional serving (2 scoops). In cool weather/heavy work, feed one serving (2 scoops) per horse immediately following competition or training session. Make sure fresh, untreated drinking water is always provided to ensure proper hydration and allow the horse to consume water as needed. The 2.5 lb size will provide one horse with up to a 51 day supply. Not for human consumption. Perfect Balance is a sugar and filler free electrolyte balanced to match the proportion of electrolytes lost through sweat. Each serving provides concentrated chloride levels, and chelated minerals for improved absorption. It is perfect for re-hydration before and after strenuous exercise. Made with high quality, food grade ingredients and featured as 2007 Horse Journal Product of the Year. Sugar, filler, Dextrose & Sodium Bicarbonate free. Perfect Balance Electrolyte is an excellent choice for performance, trail or IR horses. One dose is 2 level scoops (approximately 22 grams). In hot weather or with moderate to heavy work, feed one serving (2 scoops) per horse twice per day. When competing feed one serving (2 scoops) within 1 to 2 hours prior to competition. Immediately following competition, feed one additional serving (2 scoops). In cool weather/heavy work, feed one serving (2 scoops) per horse immediately following competition or training session. Make sure fresh, untreated drinking water is always provided to ensure proper hydration and allow the horse to consume water as needed. The 30 lb size will provide one horse with up to a 618 day supply. Not for human consumption. The art of successful riding is the development of harmony to such a degree, that, to the onlooker, horse and rider perform in total unity. The rider's key to this ideal is not a static seat, but one that is capable of adapting to all movements of the horse. 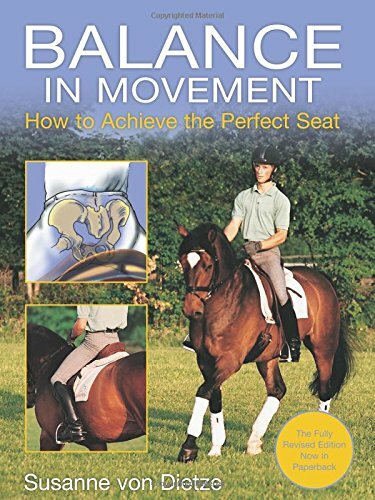 The closer the seat follows the movement, the better it can influence that movement and remain in perfect balance with the horse.With the perception of a physical therapist Susanne von Dietze analyzes the seat and its influence, and discovers the sources of numerous mistakes and weaknesses in this area; and with the perception of an experienced trainer she gives explanations for a greater understanding and suggests many useful exercises.First published in 1993, Balance in Movement, has long since become a classic in equestrian sports literature. It is an indispensable source of advice for all who would like to have a better understanding and command of the rider's seat, teachers and students alike. Known as "white gold" those in that part of the world, Himalayan Rock Salt is the purest form of salt available on earth. Mined from ancient deposits deep in the Himalayas, salts contain many of the valuable minerals your horse needs to promote a healthy balance in the body. Iron, potassium, and magnesium are particularly useful in replenishing electrolytes lost during hard work. It is these minerals that give the Himalayan Rock Salt its signature rosy color. Mikes Instinct Himalayan Rock Sock is 100% all natural. 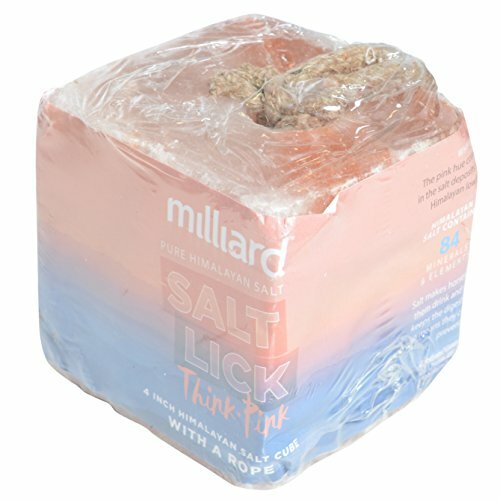 Perfect for horses that won't lick a block. Just sprinkle on the horse's feed. Whether you are a horse owner or an experienced farrier, the Rural365 Small Hoof Rasp is perfect for hoof balance, rounding, and easy break over. Best for use on small hooves: goats, pigs & small horses and ponies. You can easily remove flares and fix cracks, splits, and chips with this tool. Perfect for small hands or just an easy grasp, the soft wooden handle provides indents for a stronger grip. 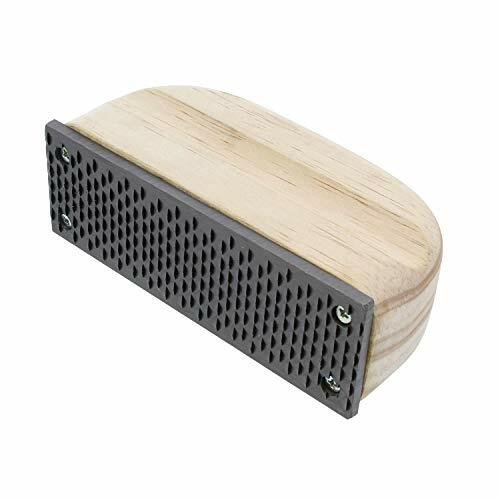 This simple hand tool has a 5 by 1.8 inch (12.7 x 4.6 cm) stainless steel flat blade screwed into the wooden handle. With its course teeth, this aggressive design helps you to rapidly smooth edges, remove flares and cracks, and to even assist in creating the basic contour of the Mustang Roll. The comfortable one-handed grip is easy to maneuver and allows you to work faster and more efficiently. WARNING: This product can expose you to chemicals which is [are] known to the State of California to cause cancer and birth defects or other reproductive harm. For more information go to www.P65Warnings.ca.gov. Want more Perfect Balance Horses similar ideas? Try to explore these searches: Clear Vinyl Footwear, Phoenix Leather Book, and Animal Glues.